I will not lie to you, dear readers: I have had a rotten day. In fact, I have had a pretty rotten week. Getting “buzzed” while frantically trying to remove a surge protector and various extension cables as rain water was cascading upon them is not the way I like to start my morning. But after such an inauspicious start the day (or so I tell myself) can only get better. And it did! Which brings me to this. You sent this to the right person, Tony. I really needed this bit of sophomoric humor/levity today. I can only hope to toss Al a rim shot (or two) of business by posting this! 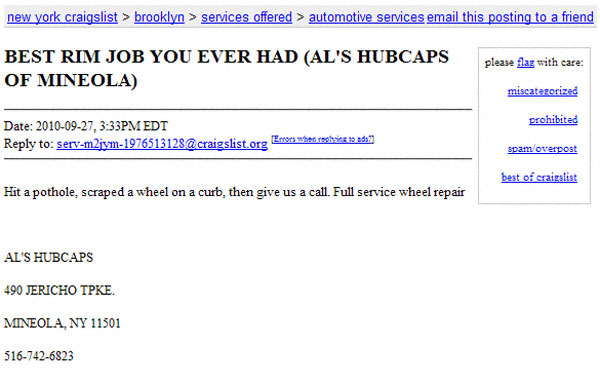 I mean, who wouldn’t want a rim job from a guy named Al in Mineola? P.S. : I wonder if he services Queens as well? I can only hope so.